German-born Jewish Canadian film actor, often cast as a shady professional. Early in his career he gained the attention of Canadian audiences when he starred as detective Benny Cooperman in two TV movies, The Suicide Murders (1985) and Murder Sees the Light (1986), which are based on books in author Howard Engel’s popular series of mystery novels set in the Niagara Region of Canada. He subsequently appeared in Oliver Stone’s Wall Street (1987) as a lawyer, and in Brian DePalma’s The Bonfire of the Vanities (1990), again as a lawyer. He is also noted for his performance in Clint Eastwood’s Unforgiven (1992) as a pulp fiction writer. He had a notable role in Tony Scott’s True Romance (1993) as a pompous, cocaine-addicted movie producer. 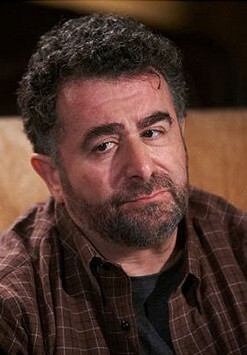 Rubinek played the character Kivas Fajo in the Star Trek: The Next Generation episode “The Most Toys”. He took over the role after David Rappaport, the actor who was originally cast to guest in the episode, committed suicide. He also played Daphne Moon’s fiancé Donny Douglas in several episodes of the American sitcom Frasier. Rubinek had a recurring role as reporter Lon Cohen in the 2001-2002 A&E TV series A Nero Wolfe Mystery, after initially playing detective Saul Panzer in the series pilot, The Golden Spiders: A Nero Wolfe Mystery (2000). He also appeared in the short-lived American television series Blind Justice. He played a dentist in an episode of Curb Your Enthusiasm. He recently played a role in the Eureka episode Invincible, and in Stargate SG-1’s “Heroes”.